It seems to me that the niche the Blue Sky Media Desk is aimed at has been open for a while without any manufacturer plugging the gap. I'd have expected one of the longer-established names to have got there first, but it's taken a relatively new entrant to the market to identify the opportunity and come up with a product. Media Desk, the third product from Blue Sky, is specifically designed, as the name rather suggests, to handle the monitoring duties in a compact computer-based audio (and quite likely audio-visual) system — the two small satellite speakers perched on the desk beside the screen, and the compact subwoofer sitting on the floor. Of course there have been satellite plus subwoofer computer-speaker packages around for not far short of a decade, and there's no shortage of smallish three-box professional monitoring systems available. But in performing orders of magnitude above the typical (and most often horrible) computer speaker package, offering suitably compact dimensions, and coming in at a relatively affordable price, the Media Desk doesn't have many competitors, at least in theory. But before examining the performance of the Media Desk and seeing how the 'in theory' works out in practice, a few paragraphs of description would seem to be in order. The basic Media Desk 2.1 system comprises a pair of passive two-way satellite speakers and an active subwoofer. The subwoofer carries a rear-panel-mounted three-channel amplifier module that provides power not only for its own 200mm driver but also for the satellites — 65 Watts for the sub and 55 Watts for each satellite. 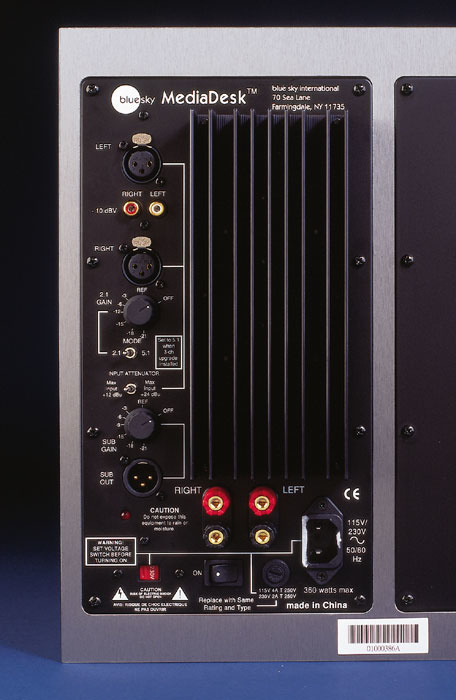 The amplifier panel also carries line input connections on phonos and balanced XLRs, satellite speaker outputs on 4mm socket/binding-post terminals, and a slave subwoofer output socket on an XLR. 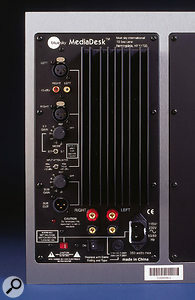 Alongside the connections are system and subwoofer gain controls, a two-position system attenuator that operates on the XLR inputs, and a switch that configures the system for use in either 2.1 stereo or 5.1 surround schemes. Connecting the Media Desk could hardly be simpler — everything goes to the rear of the subwoofer, and while you're down there connecting cables, you can switch it all on from the same position too. Blue Sky have quickly developed a consistent engineering philosophy across their three products. 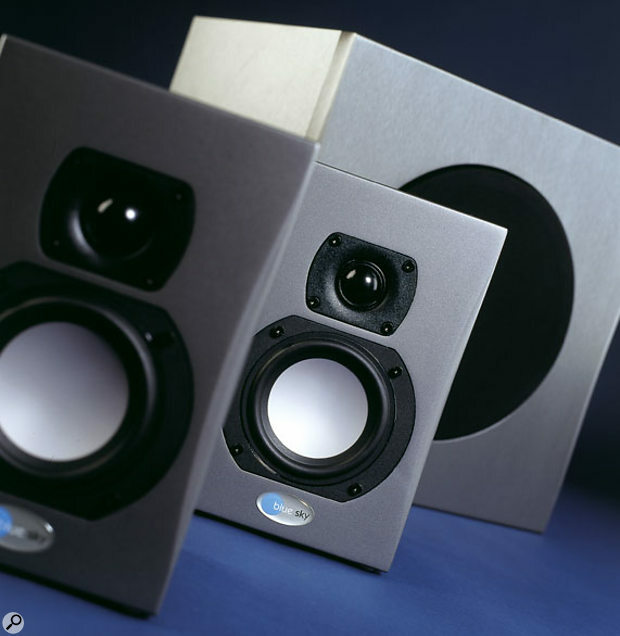 All employ closed-box rather than ported bass loading, and all but the Media Desk subwoofer use hi-tech neodymium magnets and spherical-section bass/mid-range driver cones. One significant advantage of neodymium-magnet systems is that they are inherently magnetically shielded, so they don't need any heavy compensating magnets or metal cans. The two systems above the Media Desk in the Blue Sky range employ the unusual and highly regarded XT19 ring-radiator tweeter from Vifa. The Media Desk, however, includes the more conventional, though still highly capable, BC25 from the same manufacturer. I suspect that the XT19 was both too expensive for the Media Desk's budget, and too big for the satellite front panel. Along with the Blue Sky engineering philosophy, there's also a Blue Sky product aesthetic based on simple rectangular forms in a brushed metallic-grey finish. 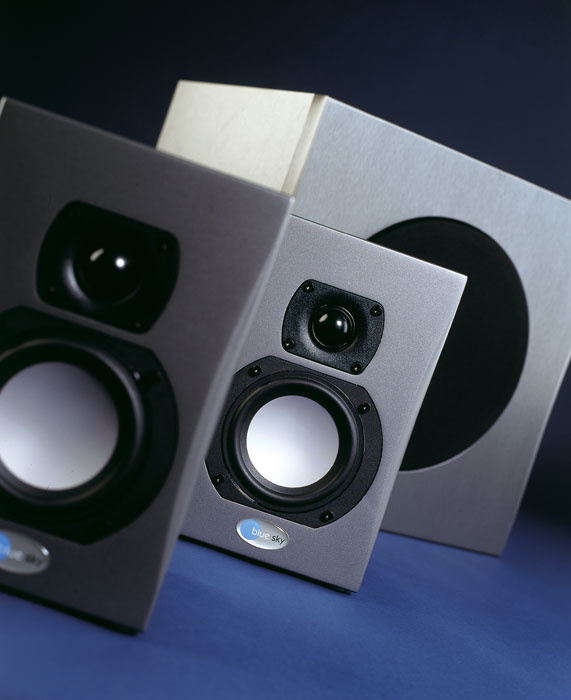 It's interesting that, while many loudspeaker manufacturers, in both hi-fi and pro sectors, are at last moving away from the rectangular box and coming up with complex, curved injection-moulded or die-cast forms, Blue Sky have chosen to follow a conventional MDF box-construction technique that's almost as lo-tech as it gets (the finish quality on my review product was not faultless either). My own feeling is that, as well as it being perhaps a question of philosophy at Blue Sky that, in terms of performance per pound, there's little to be gained by hi-tech cabinet construction, there's also the issue of the high tooling costs and production numbers associated with complex moulded enclosures. Maybe Blue Sky, as new entrants to the business, are sensibly playing a little safe on their early models? Little could be more commercially damaging to a newcomer than a warehouse full of product and a massive tooling bill. While positioning options for the Media Desk subwoofer are pretty much limited to the floor, the satellites do have some versatility. Firstly, they incorporate threaded inserts on their rear panels compatible with BT Technologies (www.btech-usa.com) and Omnimount (www.omnimount.com) wall brackets; and, secondly, they have a threaded insert on the underside that enables them, with the aid of a thread adaptor, to be attached to a microphone stand. The same insert on the underside can also have the supplied metal foot inserted in order to lift the satellite up to a horizontal position, rather than leaning back, when it's sitting on a desk. This seemed a little pointless to me, as typical desk height leaves the satellite below ear level anyway. If anything, the satellites leaning back further would help keep ears and tweeters on the same axis. The undersides of the satellites are also dotted with stick-on plastic feet. These, in time-honoured tradition, had already begun to move about as a precursor, no doubt, to falling off. I can't help feeling that stick-on feet represent an economy too far. The performance of any set of monitors depends on the room in which they are placed, and it is often recommended that you audition a short list of monitors within your own room before making a buying decision. So you'll be pleased to know, if this review has sparked your interest, that Sonic Distribution in the UK operate a loan scheme, free of charge, for all the Blue Sky monitoring systems, including the Media Desk. All you have to do is contact Sonic directly to find your closest participating dealer, and then contact that dealer to arrange the loan of an evaluation system. Terms and conditions do apply, however, which may differ depending on whether you're an account holder with the dealer in question, and these should be clarified with them. The design of any loudspeaker system brings a specific set of problems to be resolved. Sat + sub systems are particularly blessed with such problems, and small sat + sub systems are blessed even more generously than that! The first, and perhaps most critical, is the acoustic integration of satellite and subwoofer. The whole point of a sat + sub system, is that the satellites can be physically small — this is especially so in the case of Media Desk, for obvious desk-space reasons. But there comes a point where the internal volume of a satellite, and the low-frequency cutoff that results, demands that the bandwidth of the subwoofer widens such that it encroaches on the mid-range. A subwoofer that's asked to extend too far above 100Hz is straying into a region where it will become specifically audible — adding all sorts of lower mid-range colorations, destroying the system's time-domain integrity, and skewing the stereo image. Another positive is that both the satellite high-pass and subwoofer low-pass filter roll-off rates are the same second-order, 12dB/octave types — again a sensible decision. Engineering the integration of a sat + sub system carefully, as Blue Sky have done, means not only that the ultimate performance is likely to be higher than it would otherwise be, but also that the performance is more easily accessible — you're not, for example, fighting some inherent integration problem when trying to find the best location for the subwoofer. I found the Media Desk markedly uncritical of subwoofer location, and there's no better demonstration that the integration is well managed. It's a little ironic that, while the Media Desk sub has been engineered to be straightforward to locate, Blue Sky include in the manual a page of very useful guidance on the subject. The 12dB/octave roll-off of the satellite is inherent in its closed-box bass loading. Those who have read my previous monitor reviews will be familiar with my views on loudspeaker design and that I'm unconvinced (to put it mildly) about the benefits of reflex (ported) loading. Reflex loading extends the low-frequency bandwidth of a speaker by introducing a high-Q low-frequency resonance. That's the positive. The negatives are that the bandwidth extension comes at the cost of distortion, compression, and low-frequency time delay. Of course there are both serious and mild offenders — not every reflex-loaded speaker is condemned on Planet Ward, but reflex loading has become, in my opinion, predominantly a marketing-driven decision. And this is another reason why I think Blue Sky are working along the right lines and why there's a fundamental sense of 'rightness' in the way their products, Media Desk included, reproduce the bottom end of the spectrum. Not only is the satellite a closed-box design, so is the subwoofer. But what about the rest of the spectrum from bass and low mid-range upward? Along with the previously mentioned Vifa BC25 tweeter, the Media Desk satellites contain a proprietary 100mm plastic-coned bass/mid-range driver. Integration is handled by a small passive filter network with a crossover frequency of 2kHz. This is a surprisingly low frequency, as the majority of speakers with similar dimensions and driver line-up typically cross over at something approaching an octave higher. Not only would it be normal to run the bass/mid-range driver to higher frequencies, but using the tweeter down to 2kHz brings its fundamental dome resonance (around 1.4kHz) close to the pass band. Using a tweeter too close to its resonance risks unnecessarily high levels of harmonic distortion and reduces power handling. Media Desk can perhaps get away with this, however, because it is intended to be used for very nearfield desktop listening, and so will never be driven so hard that the tweeter gets into difficulty. The low crossover frequency brings advantages, though, as it improves off-axis response consistency. Again, bearing in mind the intended application for Media Desk, the engineering seems well thought out. Of course, none of the engineering would matter a jot if the subjective performance of Media Desk was poor. And it's not, it's excellent. Set up with the satellites on a large desk and the subwoofer directly underneath (against the wall but not quite equidistant between the corners), Media Desk sounded good right from the start. It is revealing of mix problems right across a wide bandwidth, and it resolves low-level detail well without being bright of balance. In fact, and unusually these days, the balance is slightly warm, made more so by the acoustic reinforcement of the large desk surface — I'd be tempted to leave a subtle low mid-range shelf cut EQ plug-in running in my main output channel while mixing. It is always a good sign when the tonal balance of a speaker system is easy to pin down, as it is with Media Desk. Speakers that, for example, seem to sound bright one minute and dull the next almost always have significant problems beyond tonal balance — a coloration that dominates, or an off-axis response that skews that balance depending on the listening position. There are no such problems with Media Desk. It just gets on with reproducing the signal accurately and consistently, to such an extent that very little more needs saying! Media Desk is the ideal product for my present setup, necessarily squeezed as tight as possible into a home office. It offers extended bandwidth combined with pitch, timing, and tonal accuracy in a compact and, if not particularly stylish, at least good-looking package. I'm not entirely convinced by some aspects of its finish quality, but at this UK price perhaps that's being a little unfair. There'll be no collection necessary for the review sample. It's staying here. Compact dimensions with wide bandwidth. Revealing clarity and a neutral tonal balance. Finish quality a little amateurish. A very effective and compact active monitoring system which is particularly well suited to the home computer studio. Media Desk 2.1 system £499; Media Desk 5.1 upgrade £500. Prices include VAT.